Admin Category Filter by SDS The module that maximizes your productivity! 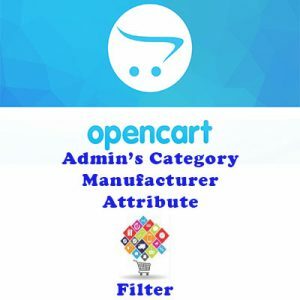 Admin Category Filter by SDS adds three extra filters (Category – Manufacturer – Attribute) on Opencart’s Admin Products list page. Search and edit a Set of Products based on Category Name or Manufacturer instead of searching by Name or Model every single one of them. Admin Category Filter by SDS extends Core Queries to include Category-Manufacturer and Attribute Filters. Tested On Installations with more that 5000 Products and 50 Categories , Admin Category Filter Can save you and your employees a serious ammount of time. Strongly recomended to stores whose Products details or prices are changing often. A small Example , lets say you want to change SEO url in every product in Category “Laptops” from manufacturer “XNX”. Normally you would use FrontEnd’s Filters because I Cant see any other way to do it right (Search by name?? what if you have 100 XNX Laptops???) . Using Admin Category Filter by sds you would type “Laptops” or “Lapt” in Category and “XNX” on Manufacturer thats it. No more back and forward through tabs. You list is there get to work! Often Stores have Products that dont belong to any Category or Manufacturer or dont have any attributes. Simply type the character “/” in one or in all three filters depend on what you want and Query will fetch you only Products that meet your search criteria. Easy Installation and OCMOD Supported so be sure that if you ever want to uninstall Admin Category Filter by SDS your core files would stay intact! (why would you want to do this though????). Also full documentation included with the module.